Hello, Floyd! Nice to talk to you. You’re an amazing boxer, and I know you like cars, but I didn’t know much about your collection until I saw this ESPN video. 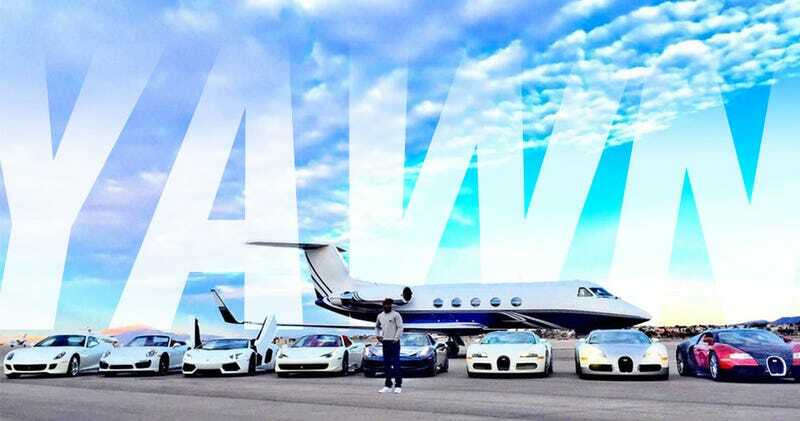 And I have to say, Mr.Mayweather, that your collection has the biggest ratio of money to boring that I’ve ever seen. But, I want to help. And not get punched into the next dimension. ESPN: And you don’t drive them?! Mayweather: You’re right it’s close to $15 million. So, that’s — among others — a McLaren 650S, Ferrari Enzo, a Lamborghini Aventador, and three Veyrons — and they just sit there, collecting dust. You must like cars, or at least the process of buying cars, but let’s face it — anyone with money can buy these cars. Sure, you’ve got a full set, but who cares? Veyrons hardly ever get driven anyway — so what’s the point of having three that never get driven? Who cares about the amazing engineering behind that car if those 16 pistons’ primary job is to not fuse to the cylinder walls from disuse and boredom? Look, you have resources most gearheads only dream about, and there’s so much more you could do than buying off-the-shelf supercars and then letting them rot in a garage. First, supercars are stupid, when you really think about it, and even more so when they just sit. You don’t have to settle for the exact same archetypal-sheik-embalmed-in-a-garage car collection, though! You could be getting some really interesting and rare things, vintage cars, obscure cars, fascinating cars. Maybe some fascinating one-offs, like the Jaguar XJ-13 or the Corvette Rondine Coupe. Maybe some really rare things, like a VW Hebmüeller Cabriolet or a Jensen Interceptor FF. Maybe you could have the absolute best, modernized versions of iconic cars, like a Singer-rebuilt Porsche or an ICON Bronco. Or, hell, you could even do something most people can only dream of and have your own cars built, to your own ideas and specifications. And you’ll probably do a much better job than Will.I.Am has done, right? Of course you would. Look, all I’m saying is that you have the ability to do so much more with your car collection than just remind everyone that yes, you’re the wealthiest athlete in the world. We get it. You don’t need to keep buying Veyrons (even if you could) to remind us. If you rigged up one of those Veyrons to run a dirt-track race, that would be impressive, though. Or even better, entered one in a demolition derby — that would really show people how much cash you have to throw around. Holy crap that could be satisfying — there could be a running tally of money on the jumbotron that jumps up tens of thousands of dollars every time you (or your driver) rams into a rusty Plymouth Belvedere. That would be a show — a gift to everyone who’s interested in cars. Beyond that, I think you’ve gotten the buy-the-normal-expensive-stuff out of your system and you’re ready to graduate into the realm of making your own fascinating collection — one that could be cool even if you still never drive anything. But you should, I think. At least drive them a little. You know where to find us if you want to brainstorm ideas about your new, awesome car collection. And, of course, this is just my own opinion, of course, and you’re likely plenty happy with your choices — I’m not trying to tell you how to spend your money. Even though I just did, for like ten paragraphs. I just think there could be so much more that could happen.